At this time of year I am minded of the fact that when the week between Christmas and New Year's Eve stretches between weekends, British people do the sensible thing and take the week off to make merry. And so it was a few years ago in 198_, during just such a week, a group of fun-loving pals decided to hold one big party and just move it each day. Much merry-making was done, wassailing and wenching and I don't know what-all else, including an hysterically funny tale at my own expense1 which I'm not going to relate. Not when the tale of Mark's Christmas Car Fiasco is right there waiting to provide a convenient distraction. It was about three days into the party and we were all waking up on the floor of a spacious terraced house2, making noises about getting a shower and changing clothes and brushing teeth and acquiring more booze for round four. Mark lived about five miles or so across town, in a small village still at that point not part of the sprawl of the city itself, and announced he was going to nip home for a bit. 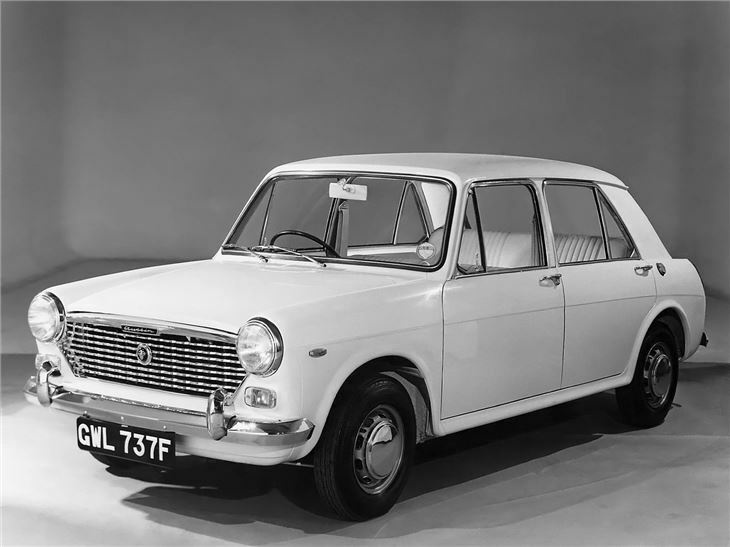 He had turned up, to the general disgust of all, in a white Austin 1100 which he was restoring in order to sell on. To get there he would drive through one of the older, busier parts of the city, then out into a spacious suburb made up of retirement communities and apartment complexes. At one point he would pass an old people's home set on a high embankment on the "bar" of a traffic-light controlled T junction with a bus stop set opposite the "leg" of the T.
It was a picturesque drive, as such things go, and there were sections in which he would be able to give his car maximum wellie, and glory in the joy of being alive and mobile in Merrie Englande at Christmas, even if it was in an Austin 1100. The road that passed the old people's home was an ideal stretch, apart from the need to cope with the traffic lights and the occasional would-be confused bus passenger wandering around into play. Clearly in the mood to indulge himself in Mercury's Domain he floored the accelerator and rocketed out of the drive into the early afternoon. A couple of hours passed, by which time we had reconvened for coffee and bullshirt, and we had fallen to wondering where our good friend Mark was. In these days of cell phones and Skype we would simply call or text him and cause an horrific traffic accident, but that was not possible in 198_, when the state of the electronic art was the CD. Phones were still tethered to the wall in them days. Eventually Mark pulled up in his rusty steed outside the house. I say "pulled up" but he actually engaged in a slow speed crash into a frozen pile of snow-covered tarmac set at the roadside where it had been left by some road repair crew the week before. "Eye-eye" we all said internally, for we all knew the signs of the aftermath of one of Mark's "episodes", and a round or two of what would now be called "Tarantino swivel-eye" was indulged in. Shortly after that Mark entered the house and, after a brief stop for a drink, regaled us with the events of his trip that had come close to killing a number of innocent old age pensioners minding their own business at a bus stop. It seems Mark had left the party house, driving up the driveway and deciding to use the aforementioned pile of frozen, snow-covered tarmac to perform an ad-hoc Dukes of Hazard style jump out of the sheer joy of having woken up from an heroic amount of libation the night before3. The car had performed a satifying leap and he had driven home without incident. It was on the return leg, as he approached the traffic lights at high speed, observed by a small crowd of disapproving pensioners from the old people's home who were waiting for a bus into town, when events became more interesting in the Chinese sense of the term. Unknown to our hero, the jump stunt had damaged the car quite badly. The 1100 design has the engine, transmission, brake master cylinder/brake fluid reservoir and front wheels on a sub-frame, a sort of sled, with the rear wheels on a second sub-frame holding up the back of the car. There is no chassis. The strength of the car comes from the body shell itself, what is called in the trade a "monocoque". It is crucial in such designs that the body shell be sound, solid all the way through, owing to the stresses of acceleration and braking. When the car had crashed to the ground, the rusty floor pan had cracked across most of its width. As Mark had driven home the car had been slowly stretching9. Every time he accelerated, the front subframe had been pulled forward against the weight and inertia of the unpowered back of the car, and the car had gotten a tiny bit longer as the crack got a tiny bit wider (and longer too). The increased sound of the road noise would no doubt have been drowned out by the volume of the Christmas Music belting out of the radio. On the trip back the car was doing Warp Factor Zoom when the stretching finally reached the point where the hand brake cables - which tethered the handbrake lever on one side of the crack to the cams that pushed on the brake shoes on the other side of the crack - pulled the rear brakes on. The increased drag stretched the car and pulled the brakes on harder, and the rear wheels locked up, to the consternation of the driver. The car, subjected to even more pull from the rear wheels, stretched a bit more and the hydraulic brake pipes, connecting the brake mechanism in the rear of the car to the actuating piston and fluid reserves at the front, decided enough was enough and pulled out of both rear wheel cylinders, disconnecting both rear wheels from the braking system and allowing the brake fluid to squirt out uselessly when the pedal was pushed. Then the brake cables, tensioned beyond their designed capabilities, and the only thing now holding the car in anything approaching its designed length, snapped, releasing the brakes and allowing the car to continue on its way unmolested by Newton's Third Law. Now even in those days a car's hydraulic system was cross-connected so that the loss of pressure in one pipe would not compromise the ability of the driver to slow and eventually stop his deathtrap on wheels. The brakes on the 1100 were connected so that in the event of a catastrophic wheel cylinder/pipe failure, the opposite wheel and its kitty-corner mate at the other end of the car worked fine, providing (in theory) symmetrical braking and saving the day. Loss of the right rear hydraulic brake and the front left may fail but the left front and right rear will work as the driver madly stamps on the brake pedal10 and optionally screams like a little girl in sheer terror. We've all been there. But the genius of Mark's situation was that he had engineered events such that both circuits had been torn to shreds simultaneously, something the car designers probably envisioned as only happening after running over a landmine or driving into a combine harvester's thrashy bits, neither of which the car had been engineered to survive, it being targeted at the suburban family rather than the post apocalyptic needs of Mad Max. The upshot was that Mark's car became a ballistic road meteor just as the lights at the T junction turned red. Mark's situation was made worse by someone having the nerve to actually pull out and turn left into his path, assuming that the mere presence of the red light on the main route would be reason enough for our hero to stop his vehicle in accordance with the law of the land and the relevant bits of The Highway Code. Mark thought fast. If he ran the red light he would crash into the car now slowing to a halt in mid-turn so that the driver could wonder why Mark was not reducing speed with the best view. The only option was to drive up the pavement (US: Sidewalk) and up the embankment so as to miss the bus stop and the crowd of tut-tutting, “young people, drive like lunatics, thrashing's too good for 'em” muttering old people standing in and around the little shelter, then rejoin the more acceptable to the eyes of the law route on the other side of the traffic lights. Now when Mark was telling this story he dwelt mostly on how he avoided driving over pensioners and didn't technically shoot the red light since he went around it and how he was really the hero of the day and like that. His audience, annoyingly for him, focused entirely on what this must have looked like to the said pensioners, who must have seen it as a mad sod, possibly crazed by Christmas Spirit, deciding to simply ignore the red light and damn the consequences. We found this scenario highly entertaining and vamped on the theme for some minutes in humorous old person voices. Mark was indignant, and then even more so when we stopped laughing long enough to remember that this had happened four and a half miles away, that Mark had continued to drive the remainder of the journey with no brakes whatsoever through a complex and dense part of the town road system, and took him to task for that with much use of unkind and hurtful words and speculation as to what was filling the space between his ears with the consensus being "air". Image of Austin 1100 sourced from http://classics.honestjohn.co.uk/reviews/austin/1100-and-1300/ and believed to be in the public domain.